This dataset identifies nativity by zip code tabulation areas within the United States. This dataset resulted from the American Community Survey (ACS) conducted from 2010 through 2014. The data set shows nativity at place of birth, native versus foreign-born. 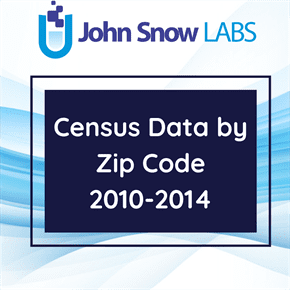 JSL enriched this dataset with Latitude and Longitude information and with the map information about the land and water area of zip code tabulation areas. The ACS 5-year estimates data is an official survey of the US Census Bureau Decennial Census Program and supplements the 10-year census data. It is a nationwide survey designed to provide reliable and timely demographic, social, economic, and housing data over the specified time period. The ACS produces the information by contacting over 3.5 million households across the country to participate in the survey. By focusing on quality geographic coverage, the ACS produces a good picture of the community’s people and housing by surveying a representative sample of the population. The ACS produces period estimates which describe the average characteristics of an area over the specified time period. The ACS provides vital information on a 1-year, 3-year, and 5-year basis. The 5-year estimates reflect a 60-month period and are designed to provide the most up-to-date, accurate, reliable, and the largest sample size available. The primary advantage of using multi-year estimates is the increased statistical reliability of the data for less populated and small population subgroups. Multiyear estimates are used when the precision of the estimates is more important than the currency of the data; when analyzing data for smaller geographies; when examining change over non-overlapping time periods; and, for smoothing data trends over time. Local area variations may occur due to rapidly occurring changes and multiyear estimates are sensitive to such changes. Multiyear estimates cannot be used to say what is going on in any particular year in the period, only what the average value is over the full period. ACS estimates are published with the margins of error at the 90 percent confidence level. The ACS estimates represent concepts that are fundamentally different from those associated with sample data from the decennial census. It is designed to provide estimates that describe the average characteristics of an area over a period-of-time as opposed to point-in-time estimates such as the decennial census, which approximate the characteristics of an area on a specific date. The ACS is a source of statistics at the local level giving even the smallest communities accurate and timely information that is essential for decision-making. The ACS estimates better reflect the growth of the population as well as the changing socioeconomic and demographic characteristics of the American people.